Proxi is an interaction design project in DES381 Design Case Study. We started with one word "music" to build an interactive product that switches daily music listeners' perspective to discover music. We began by interviewing multiple people from various musical backgrounds - everyone from casual listeners to music enthusiasts. We gained some valuable insight into points of friction across this spectrum, and narrowed down our results to three main pain points: Distracting features, difficult playlist creation, and incomplete music libraries. After couple of meetings, we defined three key drivers influence people’s desire for music. •Music itself. use music as compliments for doing other tasks. •Music Connections. watching artists’ interview talking about how they made the songs. Based on what the user category, we want to look into what are the competition out there and who are our allies. We are curious what areas have been saturated and what are the industry weakness. We want to expands our perspective on what else we can do besides our target problem. In this model, after listening to certain song in Spotify or Soundcloud, people need to recommend it to the proxi. Then, new music is can be seen and played by the people within the radius. If they like that song, it gets voted and ranks up. Now that we had a general idea of our end goal, we drew up some storyboard scenarios to imagine in what context our app could be used. Since we had a joint goal of intertwining community connection and music discovery, we wanted to allow our app to be intuitively used in both contexts. 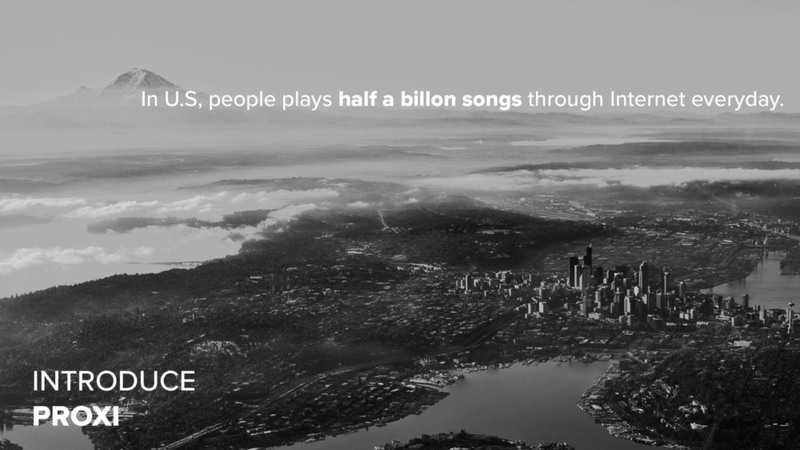 We envisioned an app that shows users a live stream of music being listened to in their area of choice. An upvoting system procures a list of trending music in a given area. Comment sections allow users to connect with each other over mutual interest in specific songs. Once we had solidified the general usage of our app, we drew out a wireframe map of the fundamental screen interfaces. Users navigated through this map by clicking "buttons" and highlighting current screens with a cutout iPhone frame. We gave users different tests to see what elements worked and what needed refinement. After testing, we discovered some pretty significant flaws with our initial design. We realized we had left out multiple important screens for various tasks. Accessing the comment section was difficult, along with elements of the music player. We recreated our interface map via Sketch and aimed to fix the multitude of problems that surfaced from our last round of testing. This version had clearer visual cues, stronger visual hierarchy, and more intuitive navigation through different elements of the app.To our dismay, users ran into many of the original problems we sought to fix. After a lot of research, testing, and some intense soul-searching, we realized that the roots of the problems lied in the features themselves. Initially, we come up with this idea which I support at first: User need to post music to proxi. Because we thought this can improve the quality of music in the library if we ask user for a little more consideration. The alternate idea is song automatically shows up itself into proxi when it is played by user. I went into office with our teacher Tad. Seeking some advise for this decision. The point here is that: When we encounter two good ideas that both are able to solve a problem and we are not sure which can solve the problem better. Goes back to the solution. We want to take advantage of the music tastes behind this Half a Billon song very day. do not care about people behind this half a billon song. For our final presentation prototype, we took multiple hero sequences and created an interactive simulation of the final product with Framer. Currently shown is the interaction between New and Trending filters, and the Commenting interface. At this point, proxi still looked very raw and flat. So i took the repsonsiblity for a better visual design. One of them is the folding comments visual. Because of previous hierarchy problem which gives people a hard time commenting. The comment function should have a nice visual cue to be discovered very quickly. Copyright ©2015 Zihan Cheng | All rights reserved unless otherwise noted.